Liverpool were pipped to the Premier League title by Manchester City on Sunday but official figures released today show they ended the season at No1 in the cash stakes, measured by League ‘prize’ money. The Merseyside giants earned £97,544,336 from Premier League funds for their 2013-14 campaign, pushing champions Manchester City into second place. City earned £96,578,329. Liverpool earned more than City because 28 of their 38 league games were screened live on TV as opposed to only 25 of City’s and TV appearances are one factor considered. The top five earners were completed by Chelsea (£94.1m), Arsenal (£92.9m) and Tottenham (£89.7m). Last season’s champions and top earners Manchester United were seventh in this season’s Premier League but sixth highest earners with £89.2m. At the other end of the table, bottom placed Cardiff City earned £62,082,302 for a campaign in which they ended up relegated to the Championship. Astonishingly this was £1.2m more than United pocketed in 2012-13 for winning the title – with the huge increases this season a result of the lucrative new TV deals now in place. Sky and BT Sport are paying £3.018 billion between them to show Premier League matches live in the UK across three seasons from 2013 to 2016 inclusive. Foreign broadcasters around world are paying another £2.3 billion combined, on top, for the same period. The Premier League also earns money from the sales of highlights (on Match of the Day) and near-live rights (on Sky) and brings in further sums from commercial deals like the one with headline sponsor Barclays. All that cash goes into one big pot and the sums announced today are the hard eye-watering rewards for the clubs. 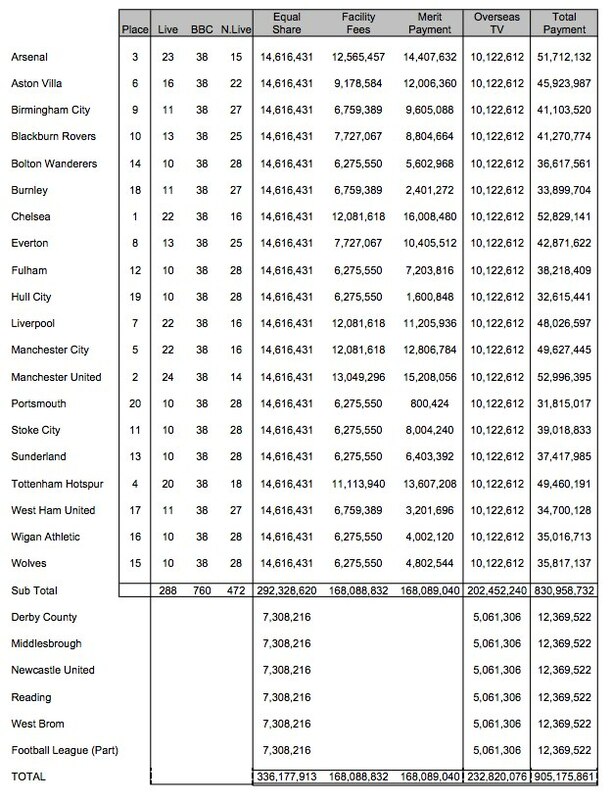 Every club gets an ‘equal’ share of £52,198,111, which derives from domestic TV income (£21,631,444 per club), overseas income (£26,295,817) and commercial income (£4,270,850). Every club then gets another sum depending on league position, worth £1,236,083 per place in the table, from that sum for bottom-placed Cardiff to £24,721,600 to winners City. Each club also gets a variable amount depending on how many times they were shown live on Sky or BT this season. Every club got a minimum of £8.6m from this pot, even if they were shown as rarely as Stoke (just seven live televised games). Liverpool, shown 28 times, got £21.9m in these ‘facility fees’. This season’s rewards are a huge leap on last season’s TV income, with Liverpool earning £42.7m more than season than last, for example. The ratio in central earnings between Liverpool at the top and Cardiff at the bottom in 2013-14 is 1.57 to 1. 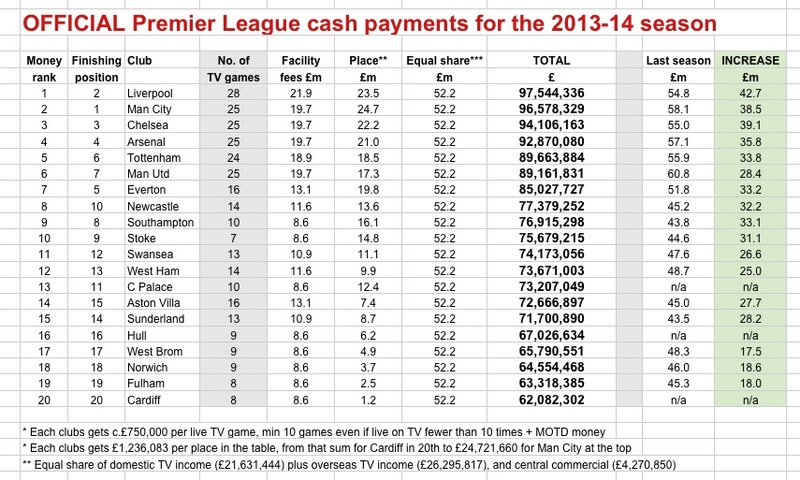 This is a much lower ratio – and therefore ‘fairer’ split of TV money – than occurs in Europe’s other major leagues. In Spain’s top division, where Barcelona and Real Madrid take the lion’s share of the TV cash because they do their own deals and don’t sell rights collectively, the equivalent ratio is around 11.3 to 1. In Italy’s Serie A, the ratio is about 4 to 1, in France’s Ligue 1 it is about 3.7 to 1, and in the German Bundesliga it is 2 to 1. In the Champions League, the equivalent ratio between the winner and the team finishing ‘bottom’ (ie a final-stage qualifier before the group) is 30 to 1.